As you read this article you will discover that which is still a mystery to many, namely, why, during the apparition of July 13, 1917, the Blessed Virgin showed Hell to the three children: Lucia, 10, Francisco, 9, and Jacinta, 7. Yes, the Blessed Virgin showed Hell to a little girl of seven, with demons in the form of horrible monsters, and souls of the damned burning in a huge fire! Why would she do such a thing? That vision transformed Jacinta’s life: from then on she agreed to suffer so that sinners could convert, and therefore avoid losing their souls forever. As you read these few pages, you will see how the love of neighbor, including sinners, can lead a child to a heroic acceptance of suffering. And how she suffered! Small, ignorant, poor and sick, through suffering Jacinta is transformed into a giant of virtue, a universal model of wisdom, inner richness and strength. I am convinced that Jacinta has something very special to convey to you. Read her story, look her in the eyes, and discover for yourself what her questioning look suggests. The vision of Hell had caused Jacinta such horror that all the penances and mortifications she could make seemed little to prevent a few souls from falling into it. “It seems to me that it was first by a special grace God wished to grant through the intercession of the Immaculate Heart of Mary; secondly, by seeing Hell and the terrible state of the souls that fall into it. One day Lucia went to see her cousin and found her sitting in bed, pensive. “I did not remember it either!” Jacinta said sadly. Jacinta would not miss any opportunity of making sacrifices to obtain the conversion of sinners. And she ran to take her lunch to them. Of course, in the afternoon, the three little shepherds got hungry. To remedy that, Francisco climbed up a green oak tree and filled his pockets with long, sweet and nutty acorns. But Jacinta suggested that they could instead eat acorns from great oaks to make the sacrifice of chewing something very bitter. Jacinta seemed insatiable in offering sacrifices. In her generosity as a little victim, all she thought of was to suffer to save sinners. For this end, she frequently accepted the harsh conditions of life as it presented itself. Jacinta's mother knew well her little girl’s repugnance for milk. One day, she brought her a cup of milk and a nice bunch of grapes. One morning, Lucia found her with an altered countenance and asked if she felt any worse. 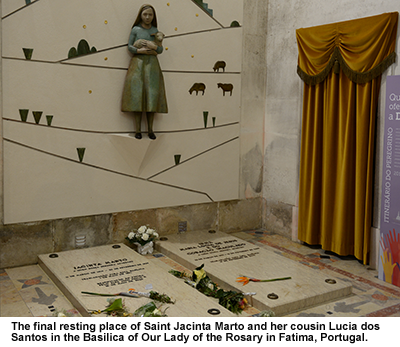 One year after the last apparition, towards the end of October 1918, Jacinta fell ill, followed by Francisco. The flu epidemic affecting so many people at the time was undoubtedly the cause of her very strong bronchopneumonia, which never healed but degenerated into an infected pleurisy with an external abscess, and ultimately tuberculosis. On July 1, 1919, Jacinta, who had been ill for almost a year, was taken to the hospital at Vila Nova de Ourem, the same town where she had been imprisioned by the Mayor back in August, 1917. Her father carefully arranged her thin and feverish body on the back of a mule for the three-mile journey from their hamlet to the town. She knew very well that she was not at the hospital to be cured, but to suffer for the conversion of sinners. The Lady had told her so. In fact, the Saint Augustine Hospital in Vila Nova de Ourem was all white and flooded with light. But the treatment Jacinta received there for two months could do nothing to improve her health, and she suffered greatly. What had begun as the flu in October 1918 had turned into tuberculosis, which affected one of her lungs. An abscess had formed and a wound opened on her left side through which oozed foul-smelling pus. She received few visits, as distance and daily occupations prevented her mother from visiting her youngest child as often as she would like. When she came to see Jacinta, she asked if she wanted anything. Of course, what Jacinta wanted the most was to see Lucia and converse with her. So, as soon as she could her mother brought Lucia with her, not a small complication as she had to make a round trip of more than twelve miles in a single day. This trip was made, not in a car or by train, but as all the poor traveled, by donkey cart. As soon as Jacinta saw Lucia she kissed her with joy and asked her mother to leave them together while she went shopping. “Do you suffer much?” Lucia asked her. The visit went by quickly and when Jacinta’s mother asked her again if she wanted something, she asked her to bring Lucia again when she came to visit. The second time around, her cousin found her suffering with the same joy for the love of God, of the Immaculate Heart of Mary, for sinners and the Holy Father. After two long months in the hospital of Vila Nova de Ourém, she returned home. She never complained or showed impatience during the daily care required by the open and infected wound on her side. In September 1919, despite her lamentable state, Jacinta was still moving a little. Weakened and emaciated, she went to Mass at the church of Fatima. But the Cova da Iria was too far away for her feeble strength. She was again the object of endless visits and questions from people who came to see her now that she could no longer hide. “Do not think about it,” I told her one day. “It’s true! I do not care at all. I don’t know what will happen to me ; sometimes I do not remember that she’s coming to get me, just that I will die without you standing by me." In mid-January, 1920, Canon Formigão, a priest who had been present at several of the apparitions and had been able to question the seers with tact and precision, returned with a doctor from Lisbon, a pious soul who came to pray at Cova da Iria with Lucia. He then met Jacinta and her parents. 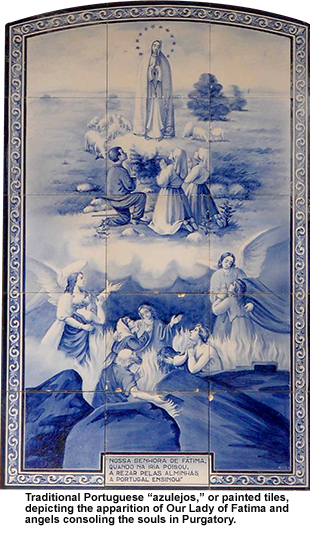 Although they told him that she had shown no improvement after the two-month stay at the hospital in Vila Nova de Ourem, and that they knew the Blessed Virgin would soon take their little Jacinta to heaven, the doctor finally convinced them to send her to Lisbon. Knowing that the use of all possible remedies to cure the little patient was not opposed to the will of God, her parents agreed and her father went to announce their decision. Jacinta was saddened by the news but accepted it with resignation. Her father explained to her that they had to send her to Lisbon so people would not say they had refused a treatment that could have cured her. 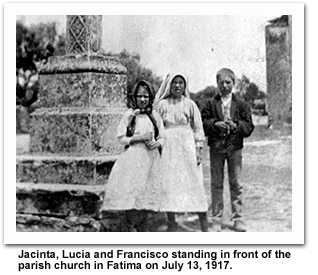 Before leaving her home forever, Jacinta asked her mother to take her to the Cova da Iria, where she wanted to pray again and see the place where the Blessed Virgin had appeared. With the help of a neighbor who lent a mule, they made the journey which they had traveled so often in the past. The little one got off of the mule a little before arriving in order to pluck a few flowers. These she placed in the little chapel that had been built where the little green oak once stood which served as a support to the Queen of the Universe. She prayed on her knees for a long while, and then, rising, showed her mother the trees over which the Lady would pass when she went back to Heaven. Then Jacinta departed with her mother to take the train to the capital. 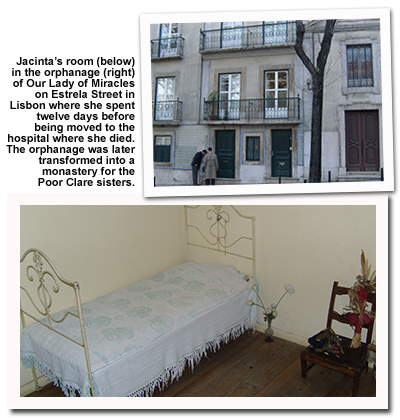 Having arrived at the Lisbon station, three ladies came to fetch them and took them to the orphanage of Our Lady of Miracles, founded and directed by Mother Godinho, where Jacinta had to wait a little before being admitted to the hospital. 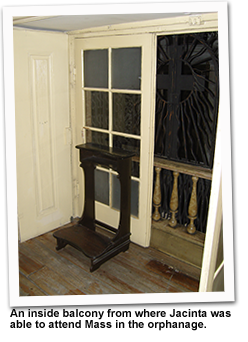 Jacinta’s great consolation was to discover that the house where she was had a passage to the back of the church adjoining the pulpit. She was installed on a small chair from which she could see the tabernacle and the altar, and she would stay there for as long as they would allow it. She was admitted to communion almost every day: finally, she was able to receive the hidden Jesus in her heart! It is certain that the Most Holy Virgin came to see her several times, conversing with her and announcing the day and hour of her death. Jacinta had someone write this to Lucia, again recommending her to be very good. She confided to Godmother that the Blessed Virgin would have liked two of her sisters, aged sixteen and seventeen, to become nuns. But since her mother opposed it, Our Lady would soon take them to heaven, something that happened shortly after Jacinta’s death. A doctor who looked after her asked her to pray for him when she was in heaven. Jacinta said yes, but told him to be prepared, for he too would soon die. She likewise predicted to another physician his coming death and that of his daughter. After hearing the sermon of a priest whom everybody admired, she said, “Godmother, when you least expect it, you will see how bad this priest is.” Indeed, shortly after that the priest left the priesthood and began to live openly in scandal. She was finally admitted to the hospital on the 2nd of February with two ribs that were turning necrotic and were about to be removed in the hope of containing the infection in the lungs. There she was separated from the company of her good Godmother and especially from the presence of Jesus hidden in the tabernacle and frequent communion. Placed in a large, cold and sad infirmary with many beds, she was as sorry as ever for sinners. She was operated on the 10th of February. Because of her great weakness they did not use chloroform to make her sleep, but only the local anesthetic available at the time. Her greatest suffering, however, was to have her little body undressed at the hands of doctors, so little attentive to the admirable modesty of that little Christian girl. She cried a great deal. For the rest of the time she was never heard to complain. The Most Holy Virgin, who came to see her several times in this infirmary, completely removed her pain four days before taking her away. The day fixed for her departure to heaven, February 20th, a Friday, finally arrived. About six o'clock in the evening, feeling ill, she asked to receive the last sacraments. A priest came from the nearby parish and heard her confession. She insisted that she should be given communion, but the priest told her that he would bring It the next day. Once he left, Jacinta insisted again to receive communion, saying she was going to die. About half-past ten Jacinta died very quietly, but without communion. Only a young nurse, whom she affectionately called “my little Aurora,” stood beside her and watched over her remains for the rest of the night. 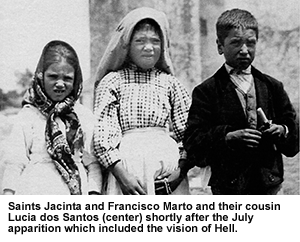 “I will return to Fatima, but only after my death,” Jacinta told Godmother. 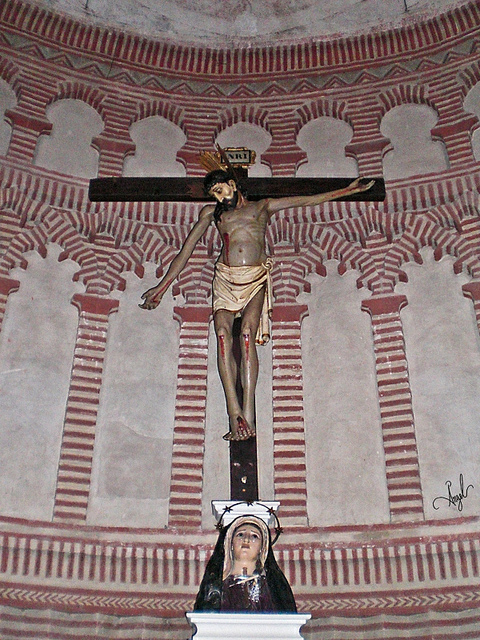 She was first buried in the cemetery of Vila Nova de Ourem, in the vault of Baron de Alvaiazere, protector of her family. Subsequently (in 1951 and 1952, respectively), the precious remains were moved to the Basilica of Fatima, where they now are. The preparatory canonical processes for the beatification of the two Fatima seers were officially opened in 1949. And on June 28, 1999, a decree was issued recognizing the authenticity of the miracle necessary for the beatification. 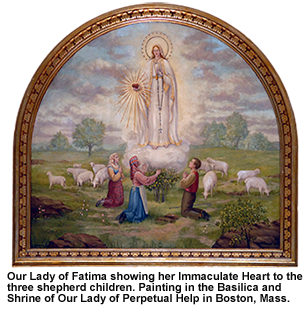 Finally, on May 13, 2000, Pope Saint John Paul II went personally to the Sanctuary of Fatima where he solemnly beatified the servants of God Francisco and Jacinta Marto before a crowd calculated at 400,000. Their canonical feast is celebrated annually on February 20th, in the places and according to the norms of the law. The story of Jacinta Marto is not for the Catholic inclined to sentimentality. It is a story of a little girl who saw with her own eyes the Mother of God, but also Hell. As a consequence of these facts and of her correspondence to graces received, Jacinta went from being a simple little shepherd girl in the fields of Portugal to a great Saint. She understood what really matters in this life as well as the immense importance and reality of eternity. She was called to be what the Church calls an “expiatory victim” and she accepted this calling with great love and generosity. Her life and example stand in sharp contrast with the 21st century and that is precisely why her story is so relevant for us today. Saint Jacinta, Pray for us! *Indeed, Portugal remained neutral throughout World War II, despite much pressure. As Jacinta prayed, the war did not go to Portugal.